One disadvantage of being right up to date with these reports is that often they are written and sent before the end of the day. I know that some of you receive a copy by email as soon as I press ‘Publish’, so would not be aware of any post scripts. So I’ll add a bit that ‘belongs’ to the end of yesterday, here. Cliff, John & Juan will know that when we were here in 2010, Monica & Walter, the owners of Hosteria Al Paraiso, arranged for a taxi to take us along the warren of tracks to a restaurant overlooking the lake and back after the meal, so that none of us needed to abstain from enjoying a glass or two of the local wine and run the risk of a drink driving conviction. The food, the restaurant setting and of course the wine helped to leave a lasting impression – the night ranks in my top 10 of favourite meals as I know it does for the others. Unfortunately, the restaurant was not yet open – here it is the quiet period between the winter sport season (just gone) and the summer season – January and February, so a lot of places are shut. Walter & Monica showed us menus for a couple of places that were open and although the food was more than adequate, it failed to live up to the 2010 experience. As we picked up coats from the car it started to rain. As the taxi arrived to take us to the restaurant, huge snow flakes fell. My worry of not being able to reach Villa Pehuenia due to weather conditions now turned into a worry that we might be snowed in here for a few days! The drive to the restaurant felt a bit like a rally cross, but the driver clearly knew his way and how to avoid the pot-holes that I managed to get every time. Two hours later he was back to pick us up. It was still snowing and some had settled along the sides of the road. I’m dreaming, of a white Christmas …. As we woke up this morning, the view out of the bedroom window was one of those Christmas scenes that features on cards during the festive season. All I have to do is Photoshop in a few reindeer and a sleigh. 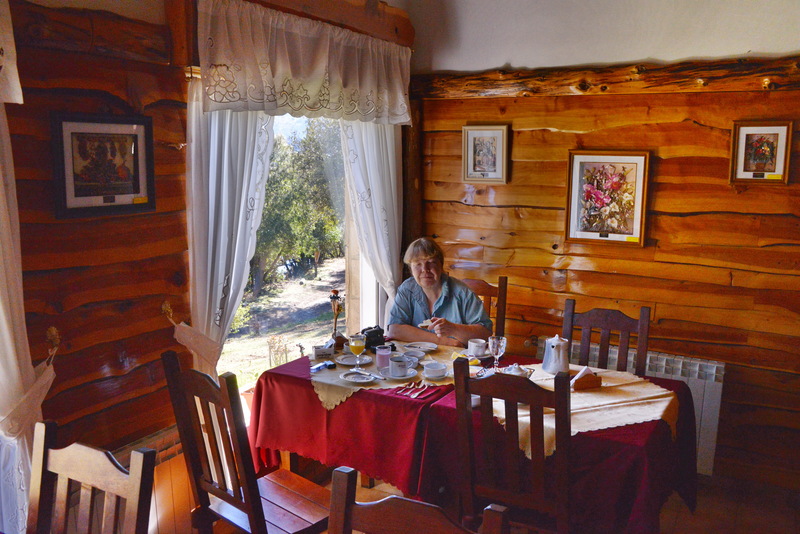 We had a nice relaxed breakfast and studied the Circuito del Lago – the Lake Loop, that would take us west, close to the Chilean border into the Andean foothills, then south, along the edge of the Lago Moquehue, before turning east towards Alumine, from where we headed back mort & west back to Villa Pehuenia, a 120 km long loop. 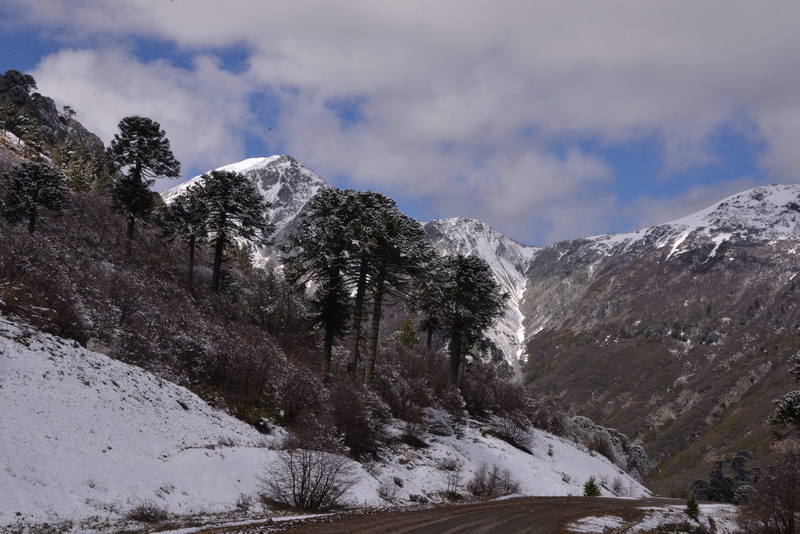 It had stopped snowing but there was plenty of snow still on the surrounding mountain sides. The roads were clear though and steam was coming of the sides. We reached the Argentine Customs post where the officer recognised us and after a note of our passport number and a note of our intended goal, we were on our way again. We followed the lake route instead of taking the turn off to Chile, but at Moquehue were confronted with another Argentine border post. The officers here clearly were bored as they took a long time reading all the documents over and over again and commenting to each other on all the exotic places that had been stamped in our passport pages. They also checked the back of the car and my suitcase, but of course found everything in order. Finally we were off again. It was very much a stop-start drive, with every bend in the road revealing yet more dramatic scenery. Araucaria trees look very photogenic after a dusting of snow! 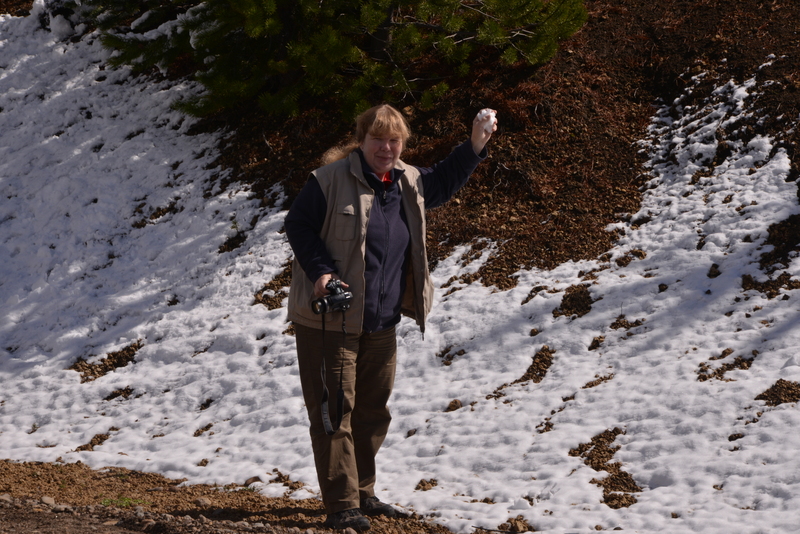 Angie picked up a handful of snow and posed as though it would end up in my face, but I hid behind the camera. At the southside of the lake the scenery changed and I remember taking this road in 2010 as well, finding Austrocactus and Pterocactus along the roadside. We stopped at a few rocky outcrops and slowly crawled past many others but failed to spot any cacti – yet I knew they had to be there. More Araucaria and snow, but no cacti! 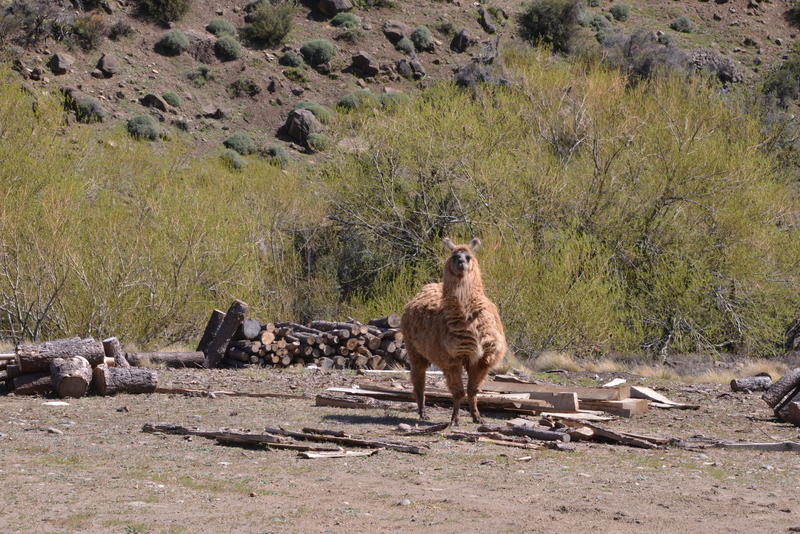 Another reminder of our altitude – llama. At Alumine I decided to tackle another looming crisis – money, or rather lack of it. The local ATM suggested a maximum withdrawal equivalent to £30. Not a lot, as the fuel tank was approaching Empty. Unlike in Chile, Credit cards (or in fact ANY plastic) are not commonly accepted here, so ‘milking ATM machines became a new pastime. Yesterday we learned that a) you could enter an alternative amount, but that 1,000 pesos was invalid and 2) that I was allowed a maximum of 3 attempts that day and 3) I could withdraw 600 pesos. So in Alumine I tried 900 peso (c £90) and succeeded, twice, as did Angie, so we now had enough pesos to feed the car, ourselves, pay the hotel bill and our guide, Martin. We got back in good time to meet Martin, our guide from 2010 and his friend, Alejandro, who spoke excellent English. The main purpose of the meeting was to agree the extend of any trip with Martin as our guide and the cost. Did we want to see Viola or cacti? Both! The bad news was that the flowers that we had seen in 2010 were open in December. Now, October, it was still too cold, so there were no Andean Violas to be seen in flower. Martin had found some more cacti, some 14 km south from the school where he was a teacher, but the other bad news was that he had to work for the next few days. We settled on meeting him at 15:00 hrs at the school for a look at the cacti and, if day light permitted, a look at the hillside where in 2010 we had seen the violas. Alejandro also told us of an exciting discovery of Denmoza rhodacantha, the first time that it was found in the Province of Neuquen, south of the Colorado River and therefore in Patagonia. Wow, that was worthy of a visit – but alas, too far for tomorrow. I asked where it was and after a few phone calls to his boss and colleagues we had very clear instructions on where to find it. It is not far from RN 40, one of Argentina’s longest roads (I bought the T-shirt in 2010) and we would pass it in a few days time! Altogether another great day with some nice surprises and a list of experiences that add to the diversity of what we are seeing. But no cacti photographed at today’s stops S2866 – images from the Lake Loop, and S2867 – views in and around Hosteria Al Paraiso in Villa Pehuenia.